♥ Ideal for children of all ages, including newborns and toddlers. The story of Tula begins with two people from distant worlds. I was born and raised in Poland. My husband Mike (Chi at the time) was born in Vietnam. Twenty years later we would start our new life together. We met in college in the United States. With contrasting personalities, we had very little in common at first. The law of opposites seemed to connect us. I was outgoing and had my mind set on what I wanted to do after graduation. My husband was more reserved and loved traveling. Even though we had many differences, we were both spontaneous, worked hard, had fun, and traveled. A lot. We visited Poland to see my family and a few times took the opportunity to backpack through Europe. On a few occasions we were lucky enough to tag along with Mike’s parents to visit his relatives in Vietnam. We saw amazing places and met incredible people and these great memories will always be a part of us. We were bitten by the insatiable travel bug. We wanted more. With a one-way ticket to Peru and no itinerary, we wanted to see how other Americans were living. We traveled off the tourist path to truly experience the South American culture. In many of the places we've traveled, we were impressed by women carrying their little ones in colorful wraps while working in fields, crafting goods, or taking care of their homes. Both mother and baby were content being snuggled closely to one another while life’s work continued. When our daughter was born, we wore her in a sling. 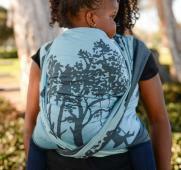 We experienced how convenient babywearing was and how much it benefits both parent and baby. A few years later, our son was born and we discovered the ease of ergonomic carriers. They were just as comfortable while being more father-friendly. We have tried many different carriers and never found one that completely satisfied us, so we had our Ba Noi (Vietnamese for Grandma) sew us one to our specifications. It was close to perfect. At first we made carriers for friends and family. But whenever we traveled, strangers would inquire about our carriers. And that was just what I needed to finally focus my energy and passion. Since then, I have loved every single moment of it! We are now a family of five living in San Diego... still making carriers, still keeping our children close, and making many memories!